Nepal and India have the Himalayas. Pakistan has the Karakoram. China has a bit of everything. Not far behind in terms of grandeur and beauty, are the Tengger Highlands of East Java, Indonesia and the best thing is, it’s so close to Singapore. 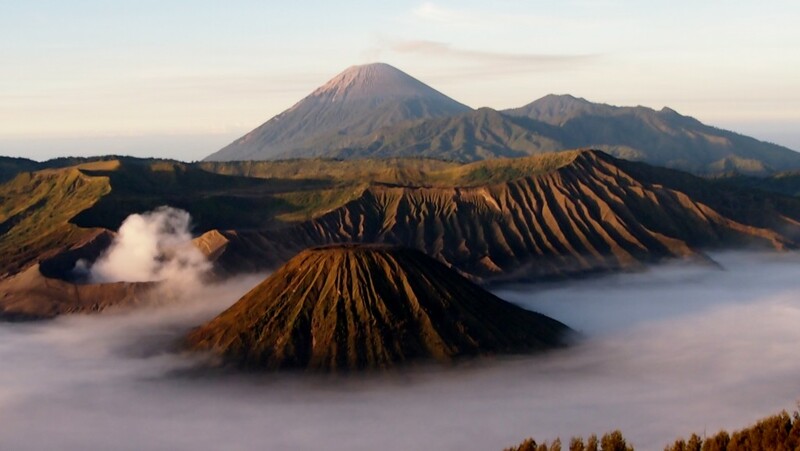 Unfortunately, Mt Bromo is hardly a secret. When I stood at Penanjakan in 1997, there were less than 10 people in total. Today, there are hundreds of visitors, fighting for a glimpse of the sunrise and the heavenly spectacle of the Tengger caldera every morning. Romantic human beings always need some mythology to “rationalise” the origins of this awesome, seemingly unearthly realm. There are many legends explaining the origins of the Tengger people. Some believe that the area was first inhabited when Majapahit Princess Anteng and her husband Joko Seger fled to these mountains to resist the Islamic movement in the lowlands during the 15th century AD. Their tribe preserved their culture and Hindu faith in these remote mountains, managing to prosper to the point of founding a Tengger kingdom, an acronym derived from Anteng and Seger. However, Gunung Bromo was temperamental and the spirit of the mountain demanded a sacrifice from the royal couple or it would destroy their kingdom by burying it in ash. Anteng had 25 children and offered one of her sons, the handsome Prince Kesuma as a sacrifice to Bromo when he came of age. 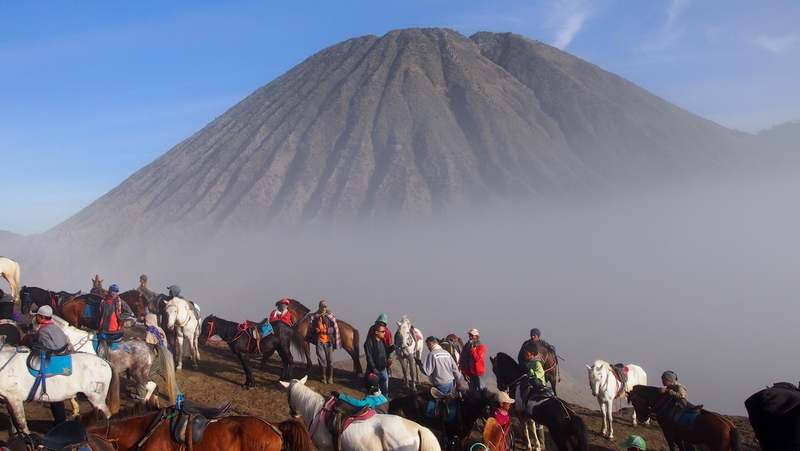 When the time came from Bromo to claim its prize, Anteng went back on her promise. Deeply insulted, Bromo erupted and the Tengger kingdom was pulled back from the brink of annihilation when Prince Kesuma sacrificed himself by leaping into the crater. The Tengger caldera is arguably one of the most beautiful places on earth and there is good reason for the crowds. Nevertheless, I find it absolutely crazy to squeeze and jostle with so many people standing on seats and holding selfie sticks, some of whom are capable of behaving like crazy football fans. That’s why in recent years, I’ve advocated an alternative approach to Mt Bromo. Penanjakan will still be crowded, but at least you’ll be far from the crowds when you first approach this magical realm. But make no mistake, going this way requires a lot more perseverance, a bit more time and some resourcefulness. The reward? You will get a more varied and complete view of this awesome landscape. Malang is a small city in absolute terms, but it is also the second largest city in East Java after Surabaya. On the day we arrived, a taxi from the airport took more than two hours to get to Malang (Rp 350k). When we travelled from Malang to Surabaya on our way back, the journey took us a little over an hour by inter-city bus (Rp 25k). The travelling time is more dependent on the traffic conditions than the actual distance. Geographically, Malang is situated at an average altitude of about 500m above sea level. Not surprisingly, the Dutch in Surabaya used to retreat here to escape the heat of the coastal city. Most of the andongs (horse-drawn carts) have already been pulled out from the streets of Malang. Current traffic conditions are not ideal and it’s difficult to get around on foot as the pavements either have large trees sprouting through them or are virtually non-existent on some roads. Still, Malang retains a lot of its charms and for the tourist, it gives great value for money. We arrived in Surabaya on a rainy Wednesday afternoon. Deciding to take it easy with my 11-year-old, I found a taxi that would bring us direct to Malang. The traffic in Surabaya was horrendous. We struggled our way out of its clutches and I was glad I didn’t ask the driver to turn on his meter or it would certainly have cost us a lot more. The rain stopped as we approached Malang. The homestay of my first choice turned out to be full. We checked out a few other places. For being so friendly and respectful, the taxi driver did not charge us extra for the search. 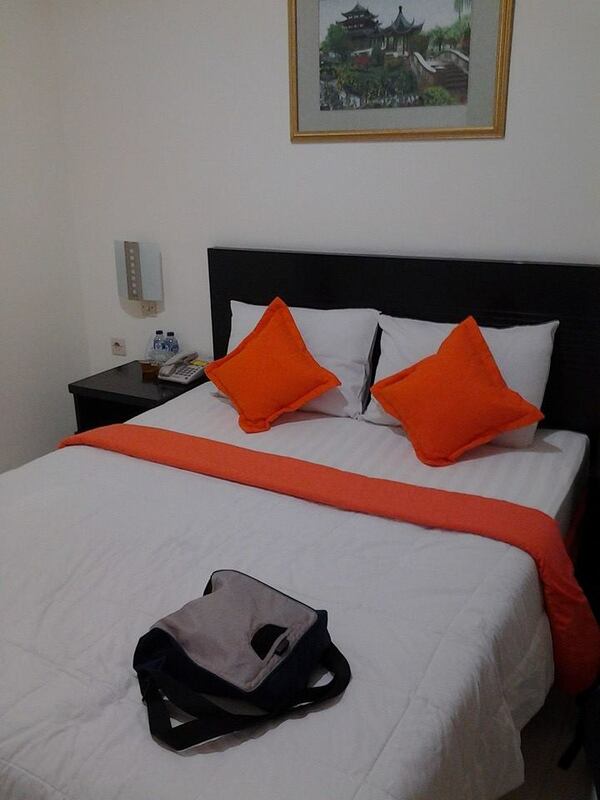 We ended up at a budget hotel that cost a bit more, but it turned out to be even better value for money at only Rp 350k, breakfast included. The next morning saw us picking up our backpacks. The friendly locals directed me to the best spot to wait for the blue angkutan kota (angkot for short) which would take us to Argosari bus terminal. It minibus was ridiculously crowded. I was sitting on the steps, with a half of my body hanging out of the vehicle until someone alighted, but with everyone so accommodating, nobody felt particularly piqued by the circumstances. A nun tried to chat my boy up, but as he could speak no Indonesian and she could hardly speak any English at all, they could only exchange smiles. We arrived at Arjosari and soon found a minibus that was going to Tumpang. The ride took us about an hour. I remember stopping briefly in the outskirts of this town the last time I came here. This was the first time I stopped at the town centre where the market, bus terminal and andong terminal are located. It was a dirty, smelly and chaotic place. It would have been nice to take a ride on an andong to Candi Jago, the ruins of an ancient Hindu temple (not particularly spectacular) not far from Tumpang, but as the transport to Ngadas was somewhat uncertain, I decided that we should not waste any time. We decided to take a minibus to Gubuklakla (1500m-1800m). It was a short ride of about 30 mins, but it was a winding, uphill path all the way. There is such a range in altitude at Gubuklakla because the village is situated on a steep slope with the highest part significantly higher than the lowest part. Compared to when I last visited more than 10 years ago, the number of houses has greatly increased. The transport hub at Gubuklakla is situated at a scenic viewpoint. There are jeeps and ojeks (motorbike taxis) parked here. I had originally hoped to share a jeep with youngsters going to climb Gunung Semeru, but as these guys were on a budget tighter than mine, their jeeps were all already overloaded. With little choice in sight, I decided to take the risky option of riding up to Ngadas on an ojek. My boy was frightened at first, but after some reassurance that the rowdy guys on the overloaded jeeps were even more dangerous and a few reminders to the ojek riders to go slow, he finally relented. The ride was hair-raising to be honest, but seeing the suppressed smile on the boy’s face, I knew that he was enjoying it. Up the winding and ridiculously bumpy and cratered concrete path we went. To be able to smoke and ride on this challenging trail with a pillion at the same time, my ojek rider must really know what he was doing. Before I could decide whether to feel worried or reassured, we had arrived at Ngadas. On this Google Earth screen capture, you can see Ngadas at about 8 o’clock position. This charming village is situated not far from the rim of the Tengger caldera. We have entered the realm of the mythical Tengger kingdom, which was first populated when Javanese Hindus who resisted conversion to Islam fled to the mountains and continued embracing the faith of their ancestors. Though they are technically Javanese, homes, shrines, temples and daily practices here resemble that of Balinese more than they resemble that of the Javanese Muslims. But like other Hindu enclaves all over the island of Java, recent years have seen migrations of Muslims from the over-populated lowlands. Some bloggers marvel at the success of social integration at places like Ngadas. The cynics see this as a time bomb. In the meantime, I think it’s always good that the Tenggerese remain the dominant group. After hair-raising 25 mins or so on the ojek, we arrived at Ngadas. The ojek riders recommended a place run by a totally toothless Tenggerese bakso seller. I was a bit doubtful at first and I could be pigheaded about not letting the two ojek guys earn their commission, but Bakso Man turned out to be one of the nicest guys I’ve met in spite of his funny smile and somewhat leaky diction. The hut was perched high on a steep slope above the road and offered a commanding view of the rugged landscape. Bakso Man told us we could help ourselves to all the ripe fruits on the trees. We were offered a wooden hut with sliding doors sans wheels. Every time I opened or shut the door, I had an intense workout with the weight of the door and the friction against the floor. It was impossible to lock the door, but bakso seller assured me that everyone at Ngadas was honest. Thankfully, the hut came with an attached bathroom equipped with gas water heater. There were probably cheaper places to stay further up, but this location had the best vista of terraced fields and colourful clutches of wild flowers. After depositing our backpacks, we walked up to the main street at Ngadas. From here, a sealed road about 2km in length continues to the rim of the cladera. There was nothing much here save some signboards, a cemetery and a stand alone warung – not the extension of any homestay. I ordered some nasi goreng and hot tea. There was also plenty of freshly fried pisang goreng for appetisers. My little one was worried about the flies, but I assured him that they wouldn’t steal his food. He couldn’t finish the nasi goreng as the taste was too unfamiliar. After lunch, we proceeded to explore the road leading towards Jemplang. This road was nicely sealed and a lot better than the broken concrete track leading up from Gubuklakla to Ngadas. Just past the Muslim cemetery, was a Buddhist temple that was locked up. The layout inside was strikingly Chinese. Could this be one of the spiritual homes for the rapidly growing number of Buddhists in Malang? It was a dry run for next morning’s trek and an easy walk for me, but the little guy complained quite a bit. I reminded him that we would be walking the same way with our backpacks the next day. Though it was misty, he could see the stunning landscape beneath Jemplang and that provided all the encouragement he needed to trek here. The presence of three warungs here (none previously) selling food, drinks and fuel bore testimony to the fact that even this difficult route is getting more visitors. Still the warungs were a welcome relief and some Coke was really in order. We returned to our hut and I noticed that Bakso Man was very busy. Looking down to the road from the balcony of our hut, I could see some semblance of a crowd outside his warung. There were farmers and workmen who came on motorbikes. There were giggling schoolgirls waiting to be served. The obvious conclusion – his bakso had to be delicious. At about 4.00pm, we went down for an early dinner. I must say that the bakso didn’t disappoint at all. I saw cow bones and innards in the soup stock. No MSG. It was the real thing and the little one loved it. After our early dinner, we went back to our huts for a hot shower. As daylight faded, it started to get seriously chilly. I went down to the bakso stall to ask for more blankets. The toothless Bakso Man was still busy. Even though he had run out of noodles, there was still a queue waiting for their beef ball and toufu soup. He apologetically asked me to wait for him. Though I didn’t enjoy standing in the cold, I was rather amused by the way he pronounced selimut as “hlimut”. Ngadas needs a dentist.